It’s almost koi season at Aquatic Veterinary Services! Here are our most common diseases we can expect to see and the signs you should be aware of if any of these diseases are present in your pond. 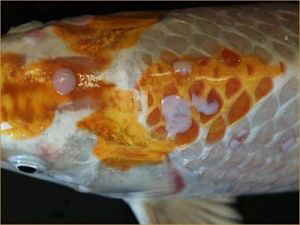 Although not THE koi herpes virus, carp pox is also known as cyprinid herpesvirus-1. It causes lesions within the skin that can look like “candlewax drippings” and “frosting” along the leading edges of the lips and fins. In cooler water temps, the lesions can be severe, but as the water warms, the fishes’ immune system and skin replacement can make the lesions almost vanish. Only in severe cases will a fish start to be compromised to secondary infections. Since this is a herpes virus, there is no treatment or cure. If you have one fish in your pond that is showing these clinical signs, all of your fish have already been exposed. Only immune-compromised or stressed individuals will show clinical signs. This is a very common disease for us to diagnose. Unless the case is severe, the fish will have good health, but will not be very pretty. These irritating little worms are most commonly gyrodactylus or dactylogyrus species. They can infiltrate the skin or gills and cause severe irritation for any fish. You will most commonly see signs of skin irritation, with increased redness on paler fish, bruises or missing scales. Since fish cannot itch themselves like a cat or dog, they exhibit a behavior known as “flashing.” Usually, you will see your fish throw themselves sideways along the sides or bottom of their pond in an attempt to dislodge these irritable invaders. Severe infestations can cause the gills to shut down and death to occur. There are many over-the-counter medications that will claim to take out these bugs. Please keep in mind that these medications are not controlled or overseen by any government checks. A veterinarian can prescribe a prescription-strength medication to take care of your problem safely and easily. Unfortunately, we often do not catch these tumors in time for surgery. Females between 8-12 years of age seem particularly more susceptible. Our Spring Pond Package for 2019 will include ultrasound screenings for all females since we are trying to catch this disease early. The only physical sign you may see is a slightly enlarged, perhaps asymmetrical, body shape. These space-occupying tumors most likely start from female gonadal tissue. By the time they are visible externally, most of the internal organs are failing. These masses are very hard to catch, which is why our new screening system will be started this year. If caught early, the tumor can be removed via surgery. This aggressive “scrubbing bubble” is often aided by our #1 disease in koi. We tend to see this parasite most commonly, often displaying the same “flashing” behavior as our monogenean friends. This parasite is easily treated by our prescription-strength medication. Over-the-counter medications do not work well against this parasite for some reason. I know it is not a “disease,” but poor water quality is the #1 diagnosis for disease I make. Having poor water quality makes all diseases WORSE, including bacteria, fungi, parasites and other pathogens. Water quality is directly linked to fish health. Like the air we breathe, the water a fish swims in has a direct effect on their overall immune function. Before the spring diseases come, get your maintenance routine overhauled and test your water chemistry regularly to make sure your fish have their best chance for a healthy spring.